Mohamed Salah showcased not only his footballing ingenuity but also his magnificent sense of humour during Liverpool’s 3-0 win over Bournemouth. 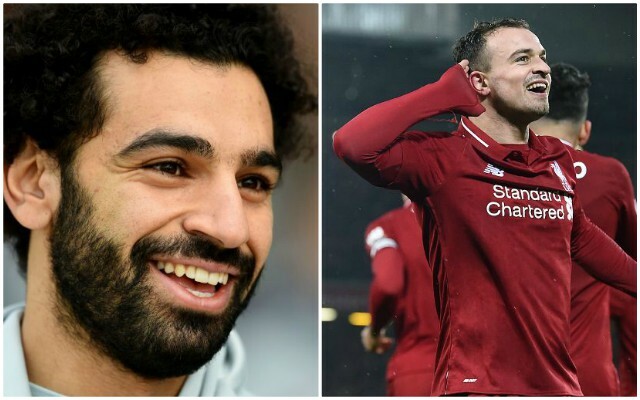 The Egyptian spearheaded an electrifying display as the Reds shrugged off Monday’s disappointing draw with West Ham to restore their three point lead at the top of the Premier League. Jurgen Klopp’s men dominated proceedings from start to finish, coming out of the blocks in explosive fashion and immediately setting the tone with an unmatched intensity. Sadio Mane headed the hosts into the lead after 24 minutes, before Georginio Wijnaldum made it 2-0 10 minutes later with a stunning lobbed finish. Liverpool then picked up where they left off after the interval as Salah finished off an outstanding team move, in which Naby Keita and Roberto Firmino both played starring roles. He notably capped his 20th goal of the season across all competitions by seemingly copying Xherdan Shaqiri’s ‘arms crossed’ celebration. This arrived amid the Swiss international’s absence due to a minor abdominal strain. There was no way back for Eddie Howes’s side form then on, with Salah and Co. continuing to torment their opponents on the counter-attack. HE HIT THE SHAQIRI!!!!! 😂😂😂 GO AHEAD SALAH!!! !